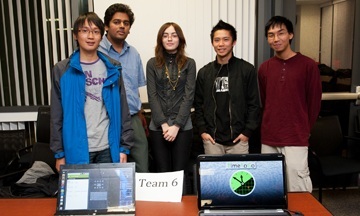 UPDATE: Winners of AppJam Winter 2012 were announced March 6. Congratulations to Team Socially Awkward Anteaters for their app "AwkTalk," which facilitates in-person meetings where two users participate in a timed topic discussion based on their preferences, then rate each other’s social skills through the app’s prescribed categories. Stay tuned for full coverage of the latest AppJam tournament. 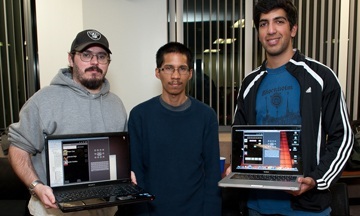 Eight teams of Bren School students with varying levels of programming experience — ranging from proficient to none — created fully functional mobile applications or "apps" in just one week, as part of the inaugural ICS Student Council AppJam Tournament. The challenge: Create a mobile app that will improve the lives of UC Irvine students academically, professionally and socially. The results: Apps ranging from the grand prize winner, “TimeToGo,” which alerts users of their appointments at a time appropriate to their location; to second-place finisher “ZotPark,” which enables users to easily navigate the UCI parking system; and third-place winner “Groups,” a way for students to keep track of their social and academic circles. 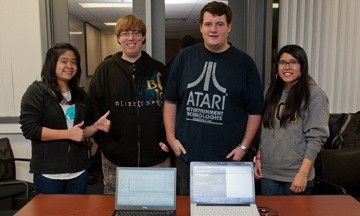 “The ICS Student Council thought AppJam would be a great way for students to learn or master coding skills while gaining real-life team project experience,” said ICSSC project management coordinator Nikola Metulev, a fourth-year Computer Science and Engineering major. “In honor of CSEdWeek, we also encouraged participants to build an app that would be appealing to middle and high school students." The competition kicked off Nov. 14, and the judging event, which featured presentations and demos, took place Nov. 22. Judges included John Libby, cofounder of MobilityWare, Farsheed Atef, chief technology officer and cofounder of Drumbi, and faculty members Michael Franz, Dan Frost and Shannon Tauro. Student peers also participated in the voting process. According to Metulev, most teams plan to add features to their apps before posting them to the Android market. Select apps may also be available for download from the AppJam website in January. 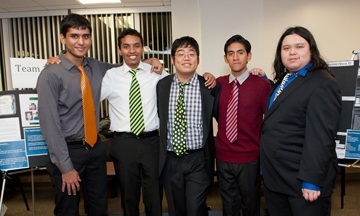 ICSSC plans to organize the next AppJam Tournament during winter quarter. View the Bren School's Flickr page for photos from the judging event. 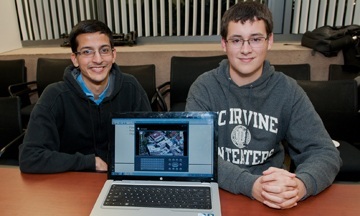 Click here for the Orange County Register story about the winning team. App description: Ever wonder how long it will take to get to class from your current location on campus? TimeToGo is an Android app sensitive to user location when issuing calendar reminders. The app also provides a searching capability and the ability to see friends’ schedules. Future goals for the team include implementing a tool on the app that takes into account multiple means of transportation. App description: Allows users to create and join study or social groups, and makes the information available to them from any Android phone. Within Groups, users can access information like name, email and phone numbers. “It’s much more compact and discreet than Facebook because it doesn’t carry your life story,” said Touchette. 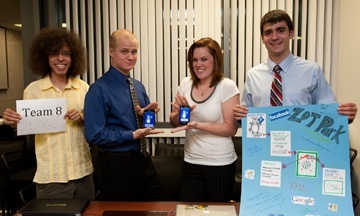 App description: Peter’s Organizer is a calendar Android app that lists events specific to the Bren School. Events are categorized as academic, social or professional, and could be added by students either through their phone or a web page. Users may filter events by category. Team comment: “Many Bren School students find out about jobs through events such as company visits. We wanted an easier way for students to find about these school events, so we thought this calendar would be useful. We then decided to expand this idea to include academic events and social events as well." App description: Metis functions as an interactive scheduling tool, allowing users to coordinate their schedule with friends, family and fellow students through a visual timeline feature. Users may sync their schedules with another user through the merge feature. 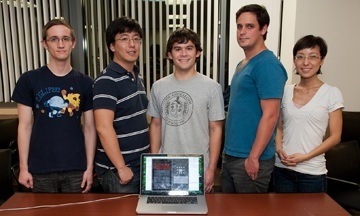 App description: ICS Earth was developed to help Bren School students locate professors and events on campus. The app allows users to search through a list of professors by name, phone number, office location or department, and through a list of events by name, date, time, location or category. The application also includes a campus map as a reference point. App description: Allows students to input their classes and information/assignments pertaining to each class. App description: Displays university activities to users. 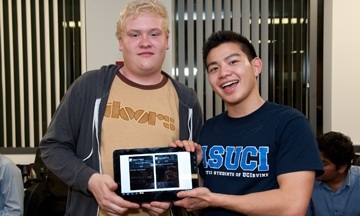 The activities can be user-created through the application and generated from RSS feeds around UCI. Users may view and join upcoming events, and invite other users to the event.